THE fact that the News & Mail has maintained its price at 50p since it was relaunched seven years ago was welcomed by local business leaders on Friday last week. 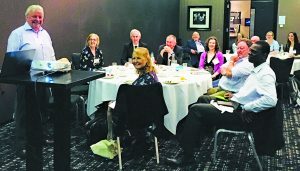 They were being given an insight on how they can improve their brand awareness through the paper during a Woking Chamber of Commerce breakfast meeting. The News & Mail’s managing director, Terry Tidbury, illustrated how the paper is seeing a growth in its sales as it focuses on “hyper local” news, with a policy of “just publishing the facts without seeking to sensationalise”.